Name: Latin Dances ! All Levels! Due to the length of the class, we cannot accept latecomers, but will work with you to reschedule upon request. Classes start promptly at the scheduled time. 1st Thursday of every Month - Mambo ! Let’s go to Cuba! And learn to dance the Mambo, made popular by films like West Side Story and Dirty Dancing. We will also take a look at Danzon-Mambo and if you don’t know about Danzon-TRUST ME-you want to know! 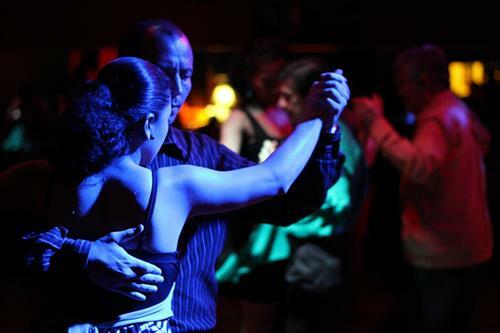 So join me and explore the rhythms, music, and dance of Cuba. 2nd Thursday of every Month - Cumbias ! Let’s go to Colombia! And learn to dance Cumbias! We will learn a certain style of Cumbia known as ‘Nortena’ and ‘Tejana’. This dance is also popular in Texas and Mexico and if you’re a fan of SELENA, then come join this class-you will LOVE IT! 3rd Thursday of every Month - Cha-Cha ! 4th Thursday of every Month - Merengue ! Let’s go to the Dominican Republic! And learn the Merengue! If you want high levels of energy and non-stop dancing then this is the class for you. We will learn not only the basics of Merengue but we will also listen and dance to classic Merengue music AND the more recent popular music known as Reggaeton. This is a dance party and you’re invited! Class sizes are small so they are extra attentive, fun, and customized to the student(s). My name is Kaleena Valdez and I am a Dance Educator, Performer, and Enthusiast with 15 years of experience and counting. I am currently a teacher and choreographer for The Ballet Folklorico Yolotzin and a member of The Academy of Mexican Dance and Music. A few of the dance forms that I practice are Ballet, Mexican folk dance, Flamenco, and Modern. In the class ‘Fitness Fundamentals’ we will incorporate dance related movement to learn how to properly and effectively warm-up, stretch, and cool-down. We will concentrate mainly on these three fundamentals in order to gain the most from our class workouts. Most importantly, I value the relationship between student and teacher and I am 100% dedicated to creating and maintaining a positive and safe class environment. Classes can be worked into your regular workout routine on times and dates listed. Email charlotte@seedscenter.org for any additional questions. $30/class/person, but take 4 classes and the 5th one is FREE! And, if you buy any Seeds Center Sampler package, and the price is discounted for your one-time classes!